— This is the 13th meeting between Wisconsin and Nebraska with the Badgers holding an 8-4 edge, including five straight wins. The Badgers haven’t lost to the Cornhuskers in Madison since 1966 (5-0 since). — The Badgers have won 16 consecutive regular-season Big Ten games, the longest streak in school history. The last loss was vs. Ohio State on Oct. 15, 2016. — Under Paul Chryst, Wisconsin is 26-4 when scoring first (2-1 in 2018), 11-4 when the opponent scores first (1-0 in 2018), 22-3 when leading after the first quarter (1-0 in 2018), 8-3 when trailing after the first quarter (1-0 in 2018), 31-2 when leading at halftime (2-0 in 2018), 3-5 when trailing at halftime, 33-2 when leading after the third quarter (2-0 in 2018) and 4-5 when trailing after the third quarter (1-1 in 2018). — Wisconsin and Nebraska have played since times since the Huskers entered the Big Ten. UW has a 100-yard rusher in six of those and are 6-0 in those games (losing the only one it didn’t). The roll call: 2017 – Jonathan Taylor 248; 2016 – Dare Ogunbowale 120; 2015 – Ogunbowale 117; 2014 – Melvin Gordon 408; 2012 Big Ten title game – Gordon 216, Montee Ball 202, James White 109; 2011 – Ball 151; 1974 – Billy Marek 145. 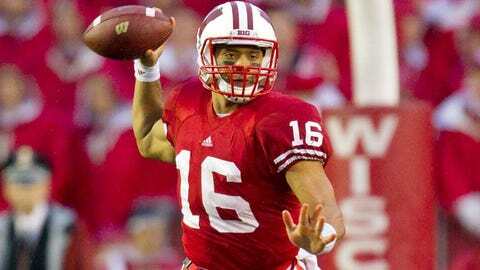 — The Badgers have four 200-yard passers vs. Nebraska (3-1 in those games): 2015 – Joel Stave, 332; 2012 – Stave, 214; 2011 – Russell Wilson, 255; 1974 – Greg Bohlig, 242. — Wisconsin has just three 100-yard receivers vs. Nebraska: 2015 – Alex Erickson, 113; 2012 – Jared Abbrederis, 142; 1974 – Jeff Mack, 132. — Jonathan Taylor needs 210 yards to pass Rufus Ferguson for 14th place on UW’s all-time rushing yards list. — Taylor needs 1 touchdown to tie and 2 to pass Larry Emery and Alan Thompson for 18th place, 3 to tie Dale Hackbart for 16th place and 4 to tie Brian Calhoun for 15th place on UW’s all-time rushing touchdowns list. — Alex Hornibrook needs 284 yards to pass Mike Samuel for 7th place and 298 to pass Randy Wright for 6th place on UW’s all-time passing yards list. — Hornibrook needs 14 completions to pass Randy Wright for 7th place and 27 to pass Mike Samuel for 6th place on UW’s all-time completions list. — Hornibrook needs 13 passes to pass Scott Tolzien for 8th place on UW’s all-time pass attempts list. — Hornibrook needs 1 interception to tie Mike Kalasmiki for 12th place, 2 to tie Hal Brandt for 11th place, 3 to tie Neil Graff and Ron Miller for 9th place and 4 to tie Mike Samuel for 8th place on UW’s all-time interceptions list. — A.J. Taylor needs 1 touchdown to tie Sam Arneson, Owen Daniels, Larry Mialik and Lance Kenrdricks for 21st place, 2 to tie Darrin Charles, Lou Holland, Matt Nyquist and Mike Roan for 17th place and 3 to tie Jeff Mack and Brandon Williams for 15th place on UW’s all-time receiving touchdowns list. — Taylor needs 178 yards to become the 30th Badgers player to reach 1,000 receiving yards. — T.J. Edwards needs 6 tackles to pass David Wings for 25th place, 8 to pass Dave Aherns for 24th place, 9 to pass Jim Leonhard for 23rd place and 11 to pass Dennis Stejskal for 22nd place on UW’s all-time tackles list. — Edwards needs 1 interception to tie seven others (most recently Sojourn Shelton) and 2 to tie David Greenwood for 7th place on UW’s all-time interceptions list. — Edwards needs 4.5 TFL to tie and 5.5 to pass Gary Casper for 15th place on UW’s all-time tackles for loss list. — Rafael Gaglianone needs 2 field goals to tie and 3 to pass Todd Gregoire for 1st place on UW’s all-time field goals list. — Gaglianone needs 1 field-goal attempt to pass Rich Thompson for 2nd place on UW’s all-time field-goal attempts list. — Gaglianone needs one 50+-yard field goal be the only kicker in Wisconsin history with four FGs from 50+ in Wisconsin history. — Gaglianone needs 10 points to tie and 11 to pass Philip Welch for 3rd place on UW’s all-time points list.